A lot of mobile language software wants to be the equivalent of an automatic universal translation app, listening to spoken phrases and translating them using natural language processing and audio recognition. Nice as that is in theory, we’re not there yet. Audio translation isn’t anywhere near perfect, and passing a phone back and forth between two speakers is awkward in practice. Enter Mantaphrase, a startup with a vision of quick, focused, visually assisted conversations across languages that help travelers get exactly the info they need quickly. Mantaphrase, a Waterloo-based company that released its first iPhone app earlier this month, provides a show-and-tell method for cross-language communication, highlighted by simple design, yes/no answers and slider-based controls for incremental responses. The app organizes interactions by category, and offers follow-up suggestions to keep the conversation flowing. It works offline, and since it’s working from a pre-determined library, while arguably less flexible, you won’t have to worry about miscommunication caused by machine error. The design of Mantaphrase is simple, but its simplicity belies the fact that there’s a lot of thought behind its user interface. In an interview, Mantaphrase co-founder Wen-Hao Lue explained that the focus was on making sure text presented to the reader was big, clear and easy to spot, and that buttons were large and convenient. They’re still getting it right – he notes that slider size will be made larger in a future iteration – but overall he says the simplicity of design, which was unabashedly influenced by Square, where Lue interned last summer. 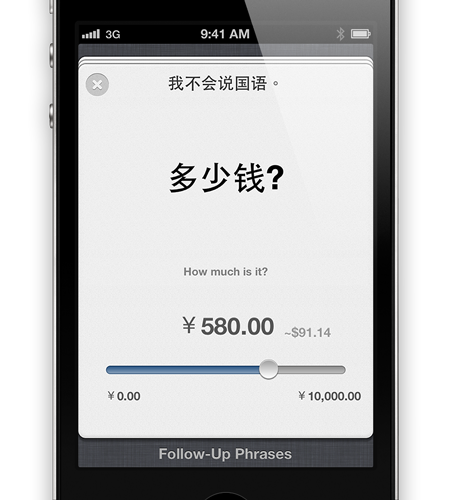 At launch, Mantaphrase supports translation between English and Chinese and Japanese. Those languages were chosen based on the founders’ backgrounds (Wen-Hao is originally from Taiwan, and co-founder Patrick Tardif spent 9 months living in Japan), and because good translation sources for stock phrases were readily available. Mantaphrase uses online databases, pares those down to about 200 key phrases, and then categorizes those themselves. The app itself is free, but language packs are $3.99 in-app purchases. Lue says they’ll look at other models going forward, including possible subscription-based pricing. To add those languages, Mantaphrase will look for strategic hires, as well as additional online sources of content freely available to use. The company is currently bootstrapped, and Lue says it has been happy with that arrangement so far, but scaling up to address four new languages could require additional outside funds. Also, later on, Mantaphrase hopes to go beyond pure utility and provide tools for users looking not only to communicate, but also to learn additional languages beyond their own. Depending on how Mantaphrase approaches that, its app could become a useful tool in second-language education.